I have been critical of the gross failure of the Board of Education’s “help” to actually help the Petersburg schools. There is one more factor that should be included in that analysis: Poverty. 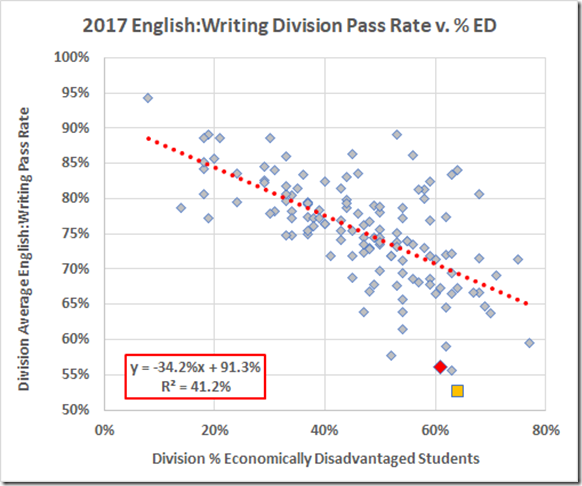 We know that increased Economic Disadvantage in the student population is associated with lower SOL pass rates. NOTE: Please remember always that statistical correlation does not imply causation. 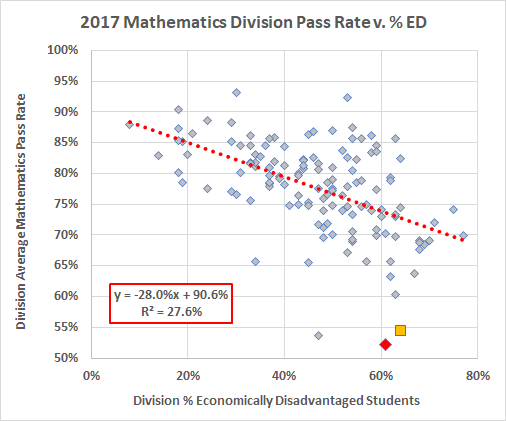 These numbers do not say that poverty causes lower pass rates, only that poverty and pass rates are statistically related and that there probably is something, or several somethings, that create(s) the relationship. So, let’s look at the data. 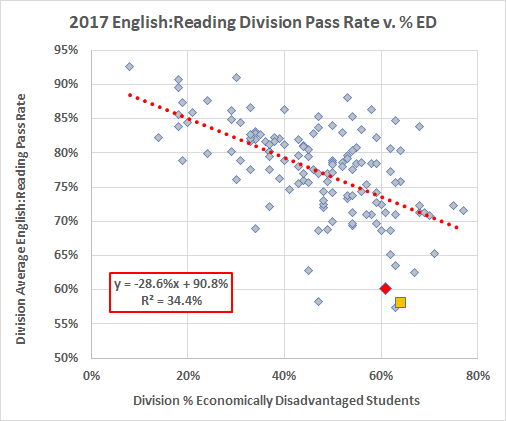 To start, here are the 2017 division reading pass rates plotted vs. the division percentage of economically disadvantaged students. The R-squared of 34% (R = 0.59) tells us there is a relationship here. 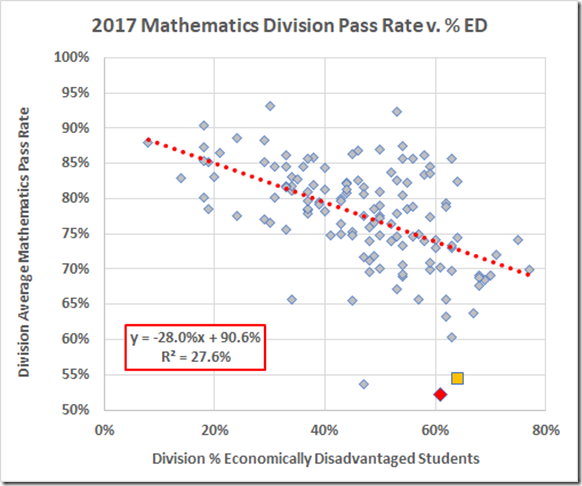 Whatever that relationship, however, it doesn’t explain the Petersburg pass rate, the red diamond on the graph. Petersburg is 13% below the fitted line. For that matter, it doesn’t explain Richmond either (the gold square), 14% below the line. Writing shows much the same pattern, with a better correlation. Petersburg is low by 14%; Richmond, by 17%. The math data tell the same story but with a weaker correlation. Here, Petersburg takes the prize, 21% below the line; Richmond is merely low by 18%. 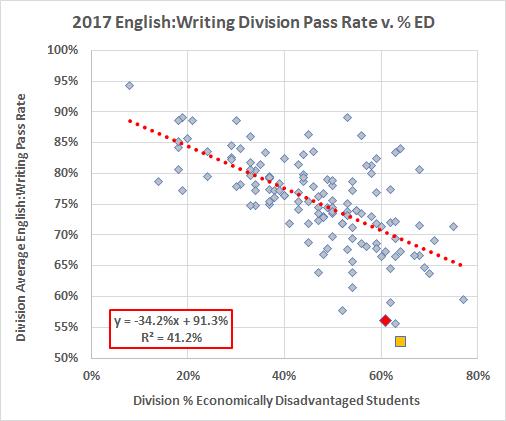 Perhaps more tellingly: With the exceptions of Greensville County and Richmond on the English tests, every division with a larger ED percentage than Petersburg had a better pass rate in these three subject areas. The conclusion is clear: Petersburg has failed, miserably. 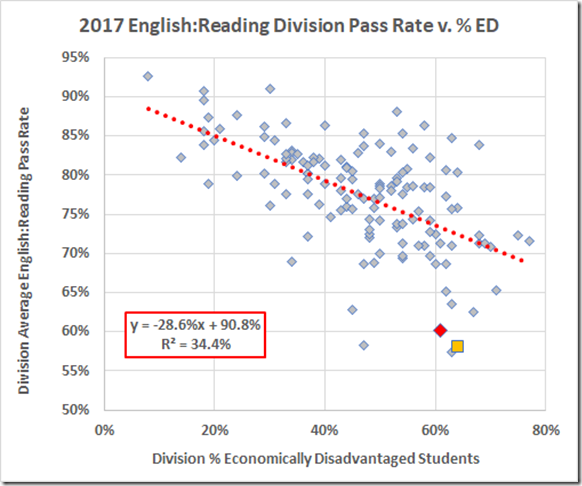 The “help” of the Virginia Board of Education (for thirteen years!) has not supplied a remedy. Petersburg’s schoolchildren are the victims of all that incompetence.